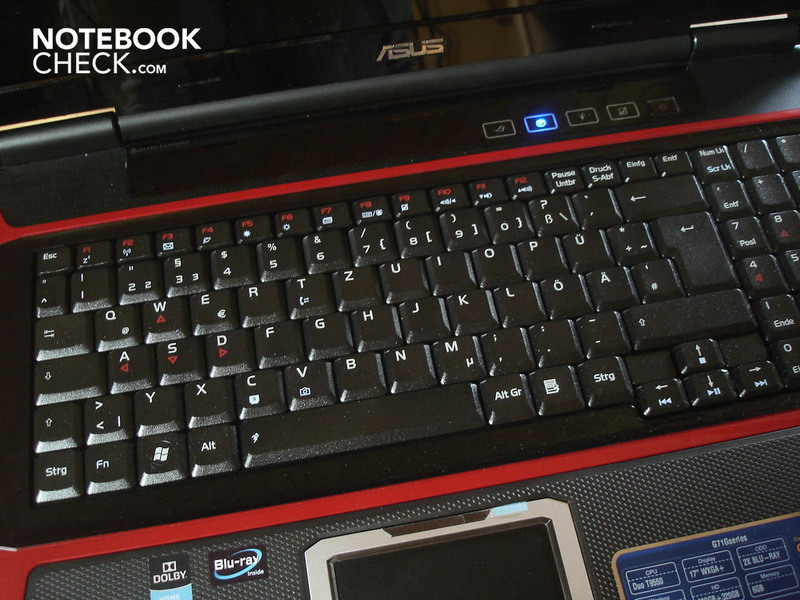 With the G71GX, Asus has a 17 inch notebook in its range, which is aimed especially at gamers with its strong components such as the Core 2 Duo T9550 and the Geforce GTX 260M. However, it should also attract entertainment fans with its Blu-Ray drive at the same time. Read in this review if this difficult straddle can be achieved. Asus currently has several G71GX models in their range. These mainly differ in their built-in processor. 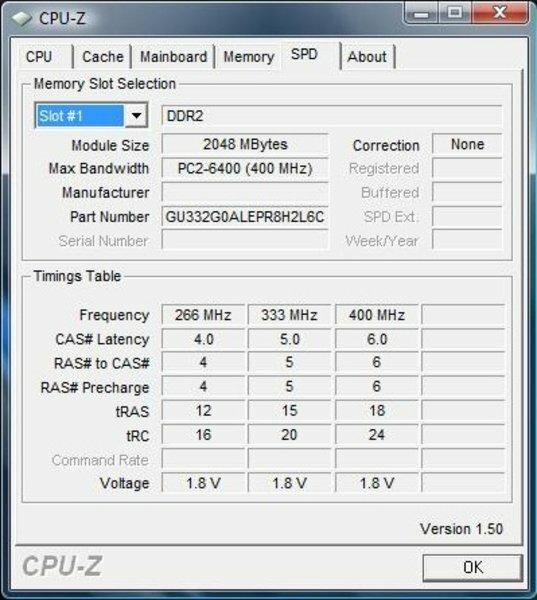 For instance, the G71GX-7S023K has a Core 2 Duo P8700 with 2.53 GHz, whereas the G71GX-7S022K has a Core 2 Duo Quad Q9000 with 2.00 GHz and the G71GX-7S008K, conclusively, has a Core 2 Duo T9550 with 2.66 GHz. The other components are, except a few details, equal: Thus a 6144 MByte DDR2-800 RAM, a 17 inch display and a Geforce GTX 260M graphic card do their job in the various G71GX models. After unpacking the G71GX, a fiery design strikes you right away. Red surfaces take turns with glossy black and matt black surfaces in a honeycomb pattern. A clear line management provides for a discerning contrast. 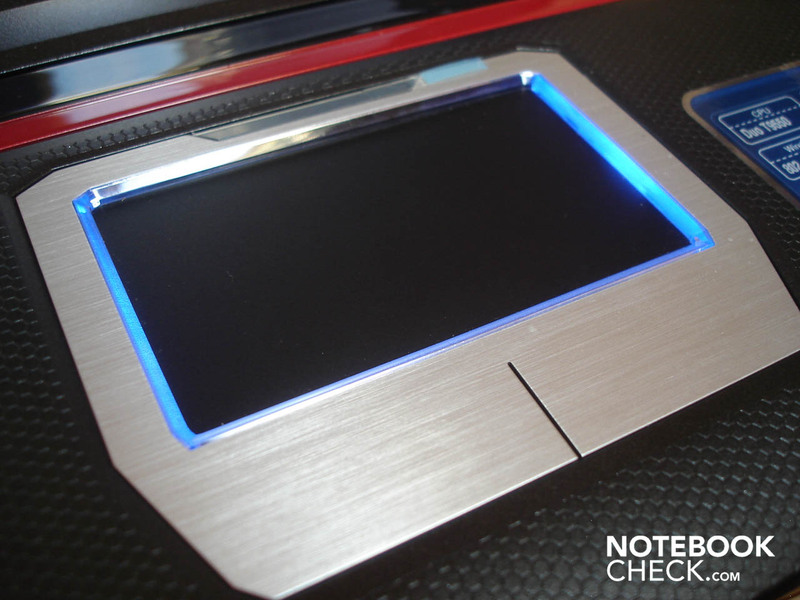 Also, a bluish lit "Republic of Gamers" logo, a bluish bezeled touchpad and bluish blinking bars on the outer display bezel "ennobles" the already eye-catching case. The design will probably be too flashy and coltish for some, but we quite liked it. The reason: Asus uses (different than it might be thought of from the pictures) rather dark red and various (admittedly after a time annoying) light elements, which can be deactivated to a large extent. However, the first high-quality impression vanishes quickly after picking up the G71GX. 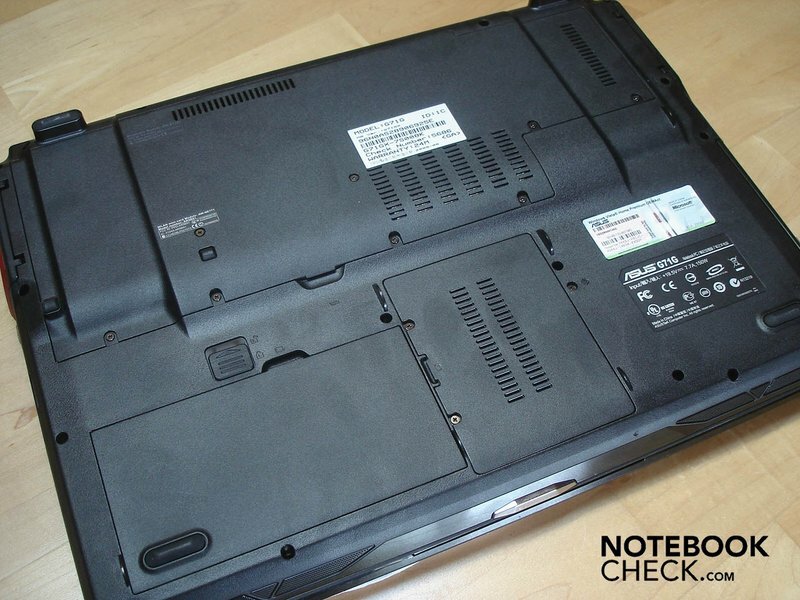 The complete case is almost completely made of plastic, even if Asus has to be given credit for this first being noticed when the G71GX is touched. In return, the workmanship is good, though; in particular the display is very stable. 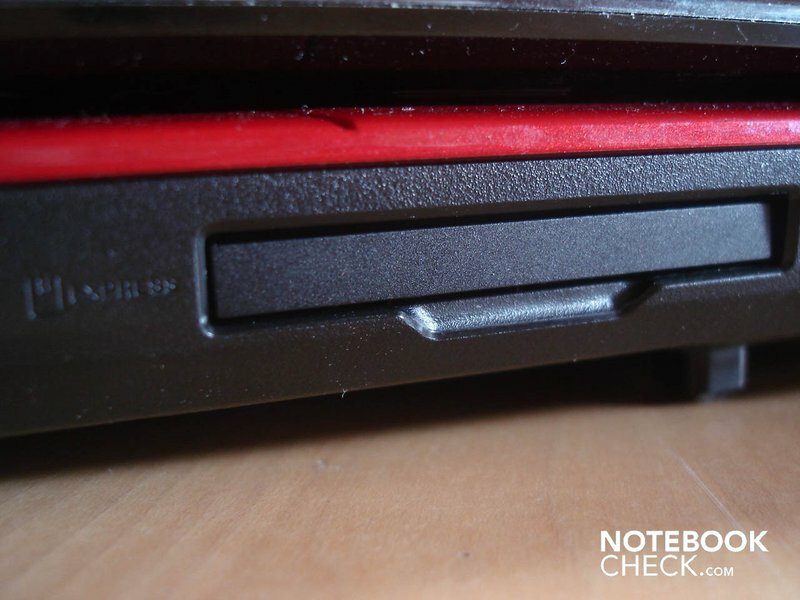 Only the area around the Blu-Ray drive bends slightly as soon as the notebook's left bottom edge is lifted. Two further things bothered us about the workmanship: On the one side, the junction between the upper side and the side area has a somewhat sharp and hard edged. On the other, the right of the two clamps, which hold the lid, can be levered out of the case without pressing the correlating closure button and without much effort. Because the case, as mentioned, has two such clamps, the lid always stays closed - despite this flaw. 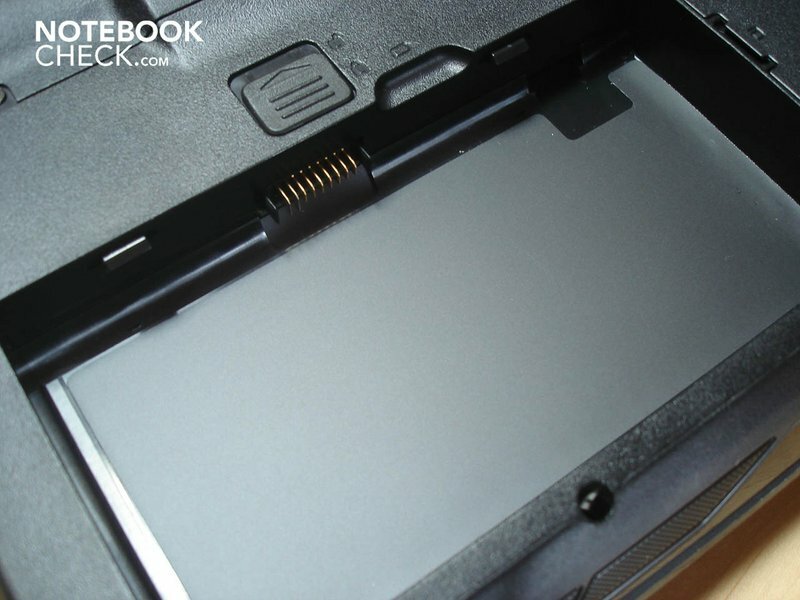 The hinges are stable and the notebook doesn't lift at opening due to its height weight of 4170 grams. However, the hinges attract attention with a partially slight groaning and squealing. The G17GX has accordingly to its size of 17 inches a variety of connections. 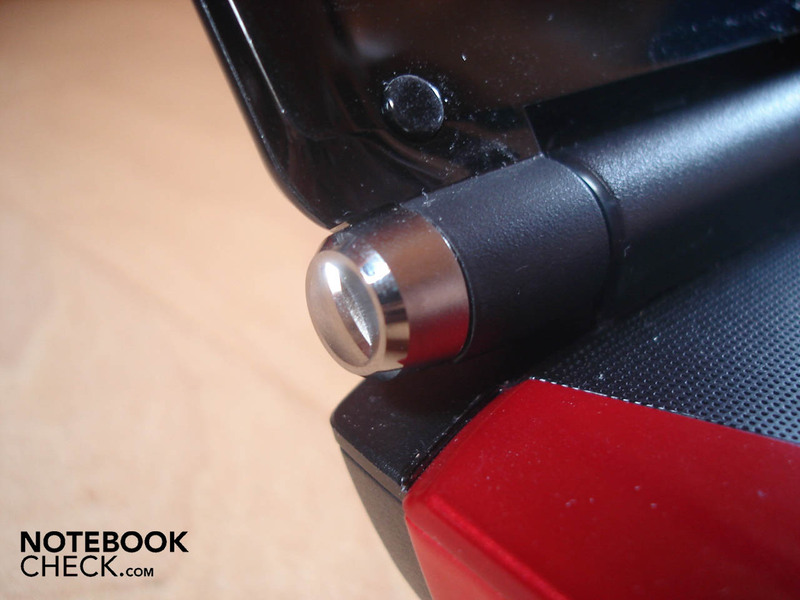 Some are hidden behind 2 red flaps, which are placed on the case's left and right side. Let's start with the front where no connections are found, aside from the status lights, the two loudspeakers and the lid closure. On the left side a Blu-Ray DVD combo drive, an 8-in-1 cardreader (SD/miniSD/MMC/MS/MS Pro/MS Duo/MS Pro Duo/xD), Firewire (IEEE 1394) and two USB 2.0 ports rest. 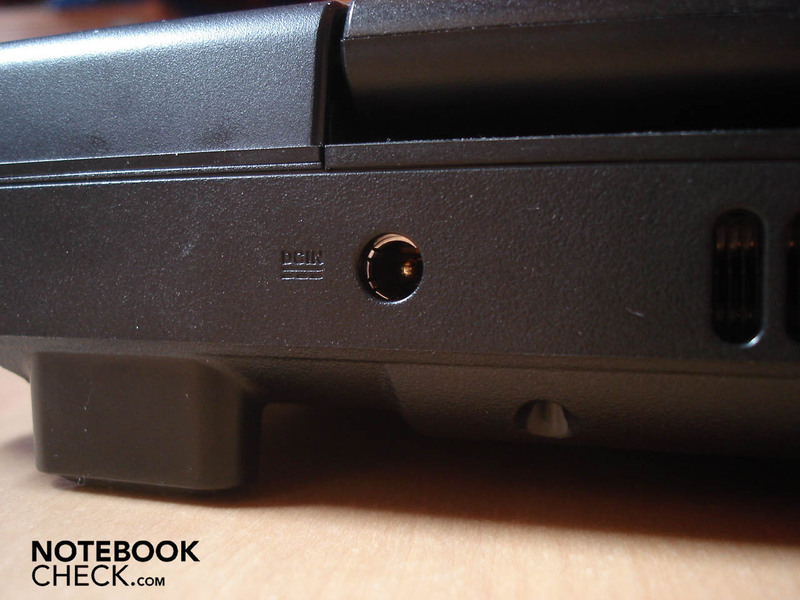 Placed on the right side is an ExpressCard slot, a Bluetooth/WLAN slider (Bluetooth 2.1, WLAN b/g/n), three sound sockets (S/PDIF, headphone-out, microphone-in) and further two USB 2.0 ports (the G71GX therefore has a total of four USB 2.0 ports). 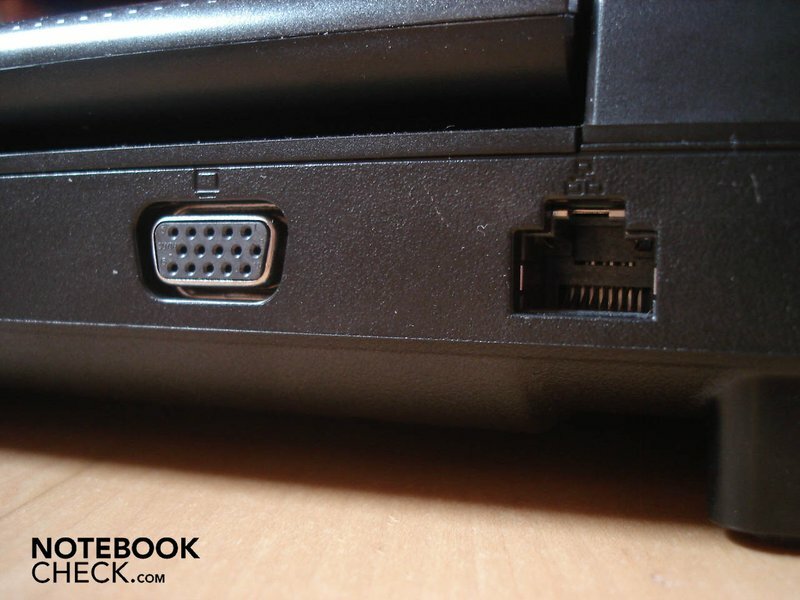 Conclusively, the power socket, an HDMI connection, an eSATA interface, a VGA-out, an RJ45 gigabit LAN port and a Kensington lock is found on the back side. Offside the lateral areas, an integrated microphone and a two megapixel webcam wait for utilization. 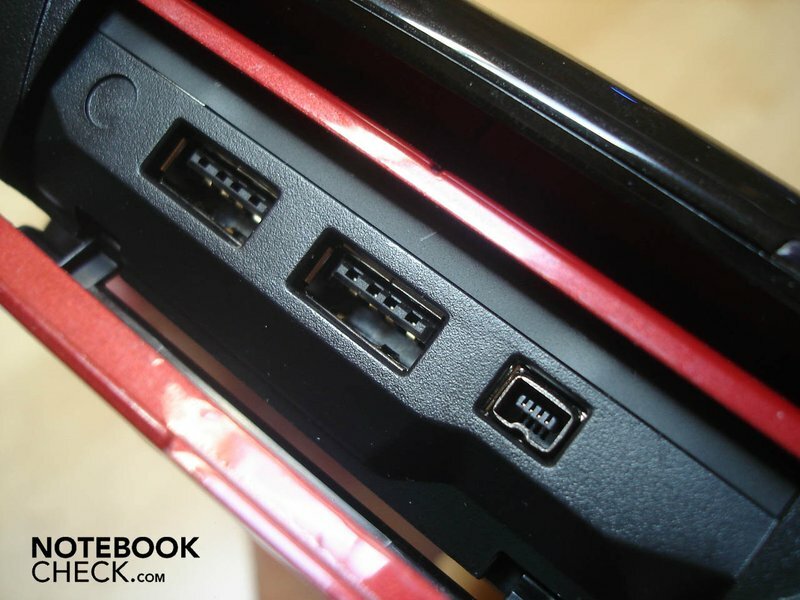 All connections are well distributed, as Asus hasn't placed any ports other than the Blu-Ray drive in the G71GX's front half. The given bandwidth of connectivity also convinced us fully. Furthermore, Asus has also included the one or other treat in the package. In the box there is a small antenna with the according cable (for TV tuners) and the fitting player software for Blu-Ray movies along with a WinDVD 8 (Blu-Ray 2CH), for which a registering for updates is required, though. The integrated Express Gate from Asus also deserves to be mentioned. With a press of a button only a tool with various mini applications is booted without starting the operating system. These cover chats like ICQ or MSN, internet telephony via Skype, online games supported by an integrated platform, music and image functions up to a small web browser. Energy and time are saved if, for instance, only emails are to be quickly checked. The use of Express Gate is very intuitive and the speed is also alright. 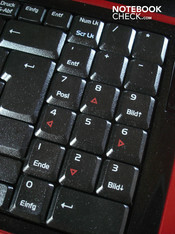 The keyboard convinces with its standard layout, merely the numerical block calls for a short accommodation period due to its different arrangement (only three instead of four vertical rows). The slightly glittering keys have a pleasant size (merely the arrow keys are a tad too small) and a deep and well-defined pressure point. Unfortunately, they often unpleasantly attract acoustic attention with clattering. 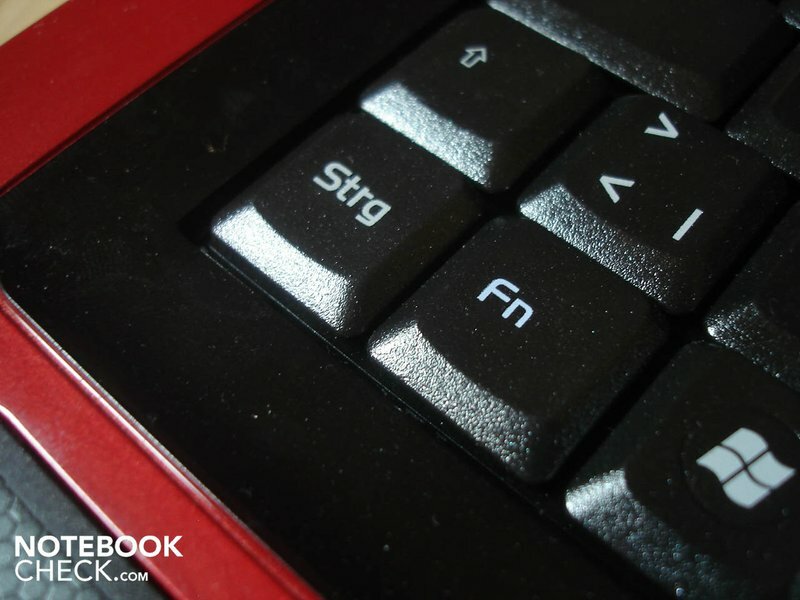 Asus exemplary placed the Fn key left of the Crtl key. Various actions can be controlled with it, such as volume, brightness, WLAN/Bluetooth and switching or deactivating displays. The keyboard, regrettably, gives away considerably on the level of the F keys and especially in the left, respectively the right corner, which barely incommoded us subjectively. The rest of the keyboard gave in only slightly at most. 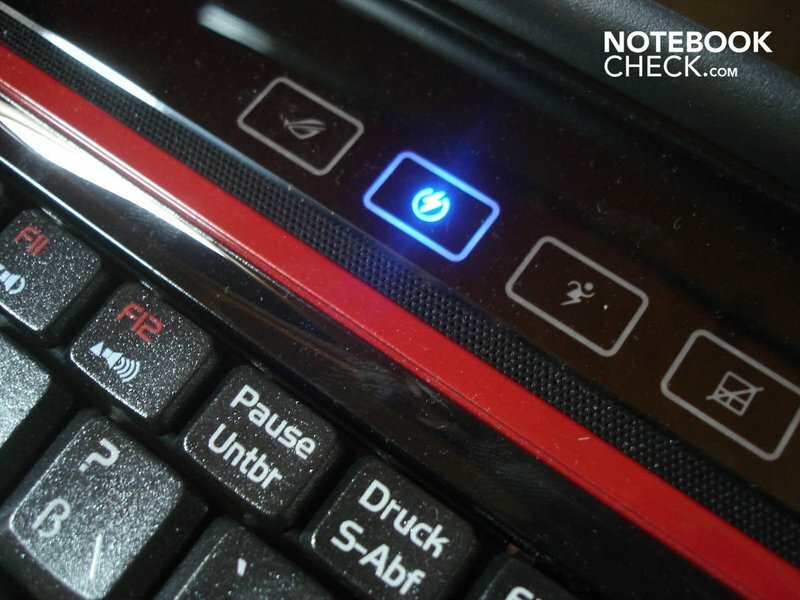 There is a touch sensitive bar above the keyboard, which gets along with a minimum of buttons. 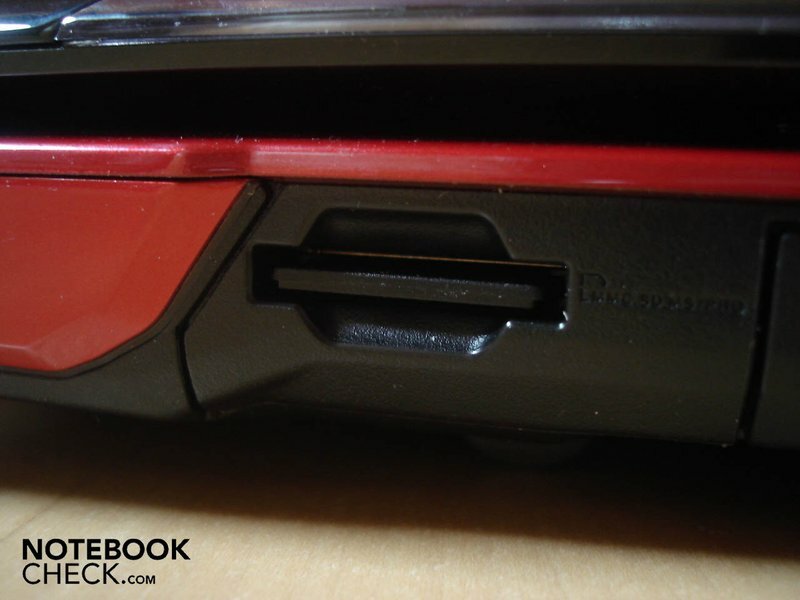 The lighting behavior of the "Republic of Gamers" logo and the notebook lid's side areas can be altered via the "Direct Console". The next button takes care of various modes for image representation, such as "Theater" or "Vivid". A further button controls the integrated overclocking function via the mode "Energy savings", "Normal", and "Overclock". 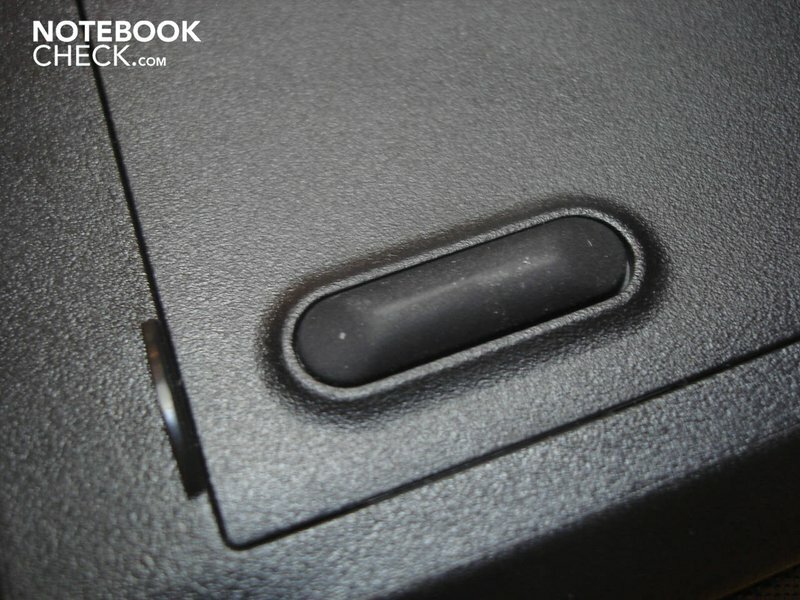 The touchpad can be deactivated with the fourth button. And last but not least, the standard power button waits. 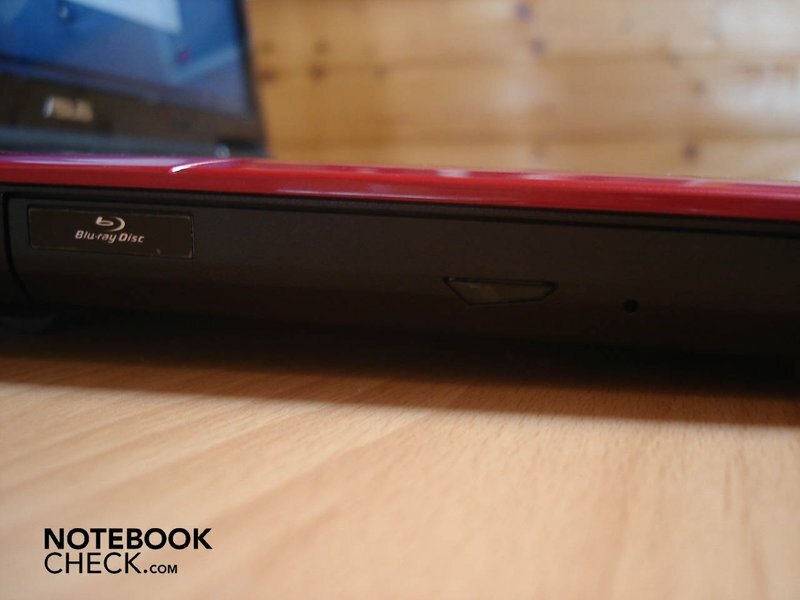 We were very pleased about the touchpad, as it has a good position and is sufficiently sized. As already mentioned, the touchpad's edge is appropriately lit in blue, with which you can orientate yourself faster in the dark. Both mouse keys are found under the touchpad, worked into a silver bezel of brushed aluminum and make a very high-quality impression. The response could quite convince us also, as the keys have a very clearly defined pressure point and the click noise at triggering gives the necessary feedback. But then there is a minute point of critique. The effort needed to press the mouse keys has turned out to be a bit high. 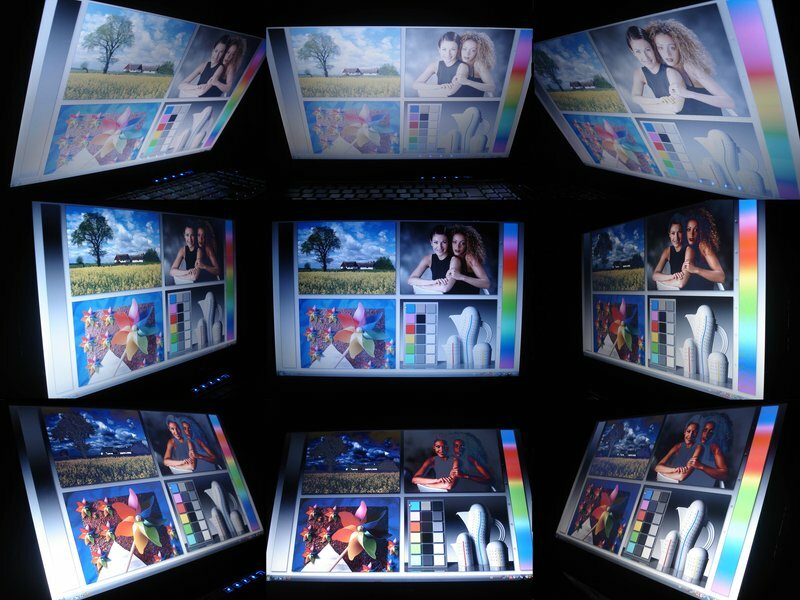 The display has a screen size of 17 inches and is, unsurprisingly, reflective. This already causes unpleasant reflections in interiors and at a normal surrounding brightness. It's no wonder then that there is almost nothing to be seen on the display outdoors. Therefore, outdoor mission are not to be recommended. Furthermore, it's not conceivable why Asus has built a Blu-Ray drive into the G71GX, but the correlating display then just has a resolution of 1440x900 pixels. 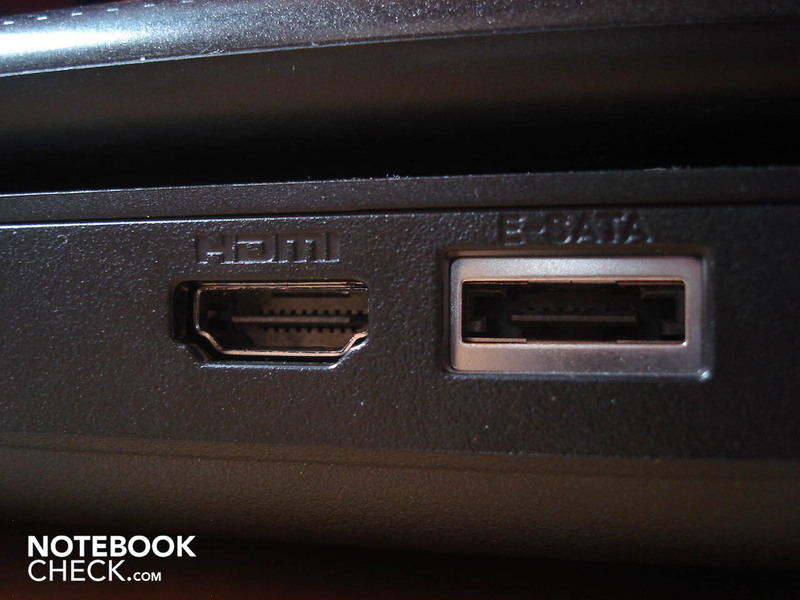 Of course, if an external monitor is connected via HDMI, every resolution up to FullHD (1920x1080 pixels) is available. The image is brilliant and razor sharp on an external monitor via HDMI. The black value of 1.14 cd/m2 might still be alright, but a contrast of 180:1 and an illumination of 72.3% are rather mediocre. The biggest disappointment is the display's brightness, which turns out very low with an average of 169.85 cd/m2. That's even only a meager 143.8 cd/m2 in battery mode. Seen subjectively, the image looked very pallid as well as colorless and made an overall rather dim impression. The viewing angles, in particular vertically, couldn't really convince. First, before the benchmarks could even start, the system was up for a thorough cleaning up. The programs and tools that Asus had preinstalled, weren't exactly funny. This resulted in an eternally long system start, a few programs in autostart and many programs in the task bar wanted to attract uncalled for attention. 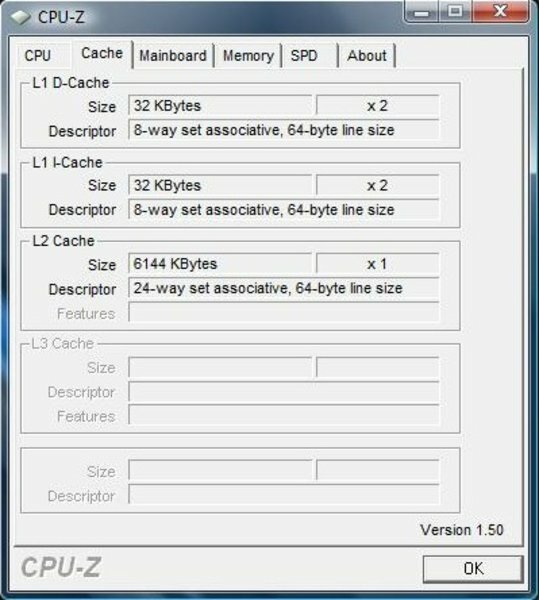 The application for overclocking the processor called "AI Gear", which can be seen in the task manager, is always open. 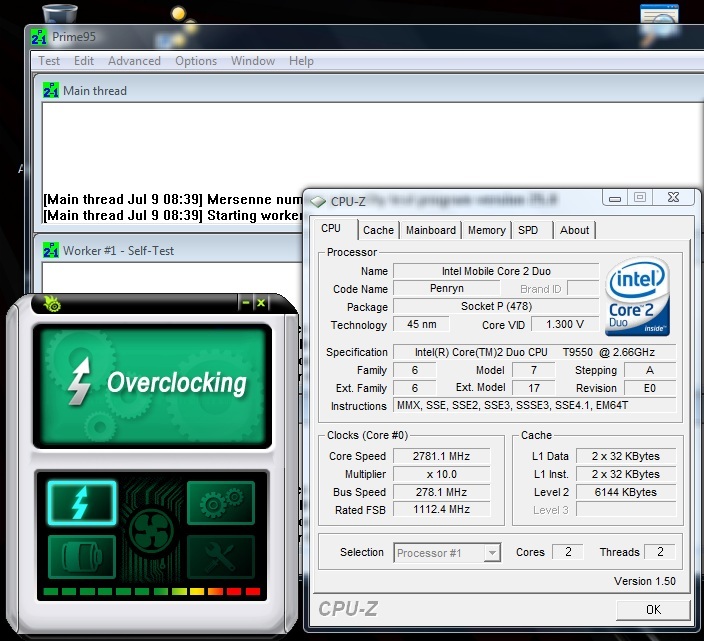 Talking about overclocking: The processor rate can be increased by either three or five percent. 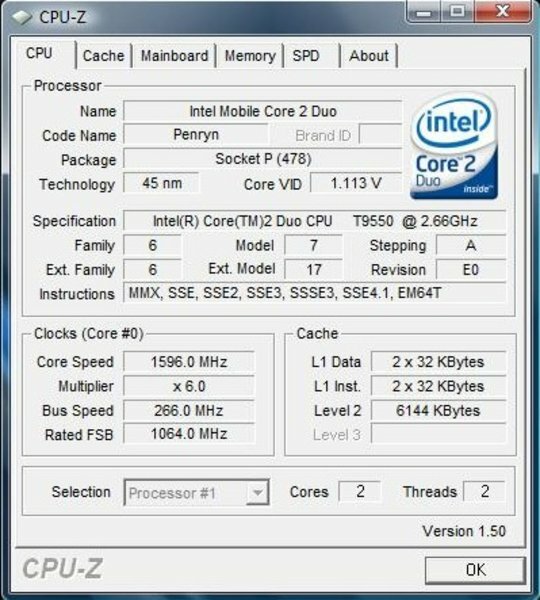 Then the Intel Core 2 Duo (1066 MHz FSB, 6 MByte L2 cache) doesn't clock with its usual 2.66, but with up to 2.78 GHz. That's "only" 120 MHz more. The efficient Geforce GTX 260M with an opulent 1 GByte DDR3-VRAM is used as the graphic card. This upper-class graphic card with a 500 MHz chip, 800 MHz memory and 1250 MHz shader rate, isn't based, as the name might suggest, on the desktop series with the same name and therefore isn't an equivalent to GTX 260. In truth, it's based on the G92b core, which is already used in the mobile Geforce 9800M GTX and is therefore rather comparable with the performance of an average 9800 GT of the desktop field. 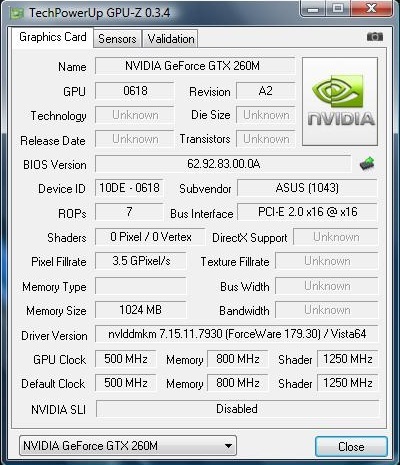 Anyway, the performance of the Geforce GTX 260M is very good for a mobile model, as we will see in the benchmarks. 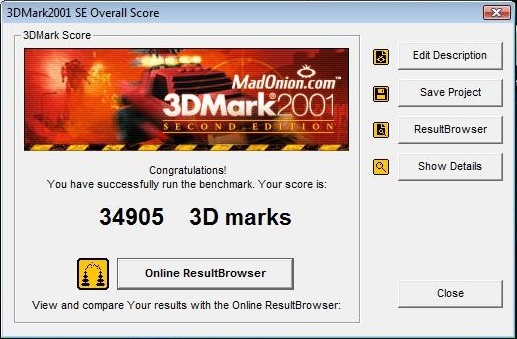 The 3DMark2001 ran as smooth as silk across the display with a total of 34905 points. In the 3DMark03 it was still a high 2300 points. Stop......2300 points? That's definitely too low. Yes, that's right. We were also taken aback. We first thought it was an error in 3DMark, though and rebooted. 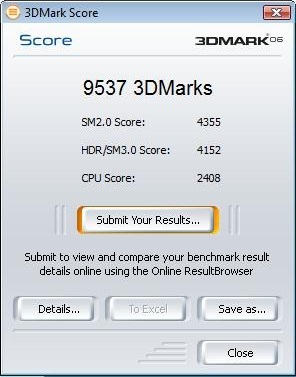 Unfortunately the error turned up again - and not only in the 3DMark, but in all other benchmarks and games. The values, respectively frames per second, were generally all too low. We deliberated, tried this and that, checked everything. The component temperatures were all within a frame. Short: We couldn't find any cause. Then we remembered the installed "Live Update" tool, which offered an update to the new bios version 1201. This allegedly changes the "Thermal Policy", the heat guidelines. Fortunately, the bios update was fast and uncomplicated. And see there: The sudden performance crashes were gone - at least for a time. During the next six hours of benchmarking, the problem turned up twice again, but wasn't reproducible. So we think, the error hasn't been scotched, instead only turns up less frequently. In any case, this circumstance is aggravating and therefore only rather experiment-eager and frustration-resistant natures should turn to the G71GX at the moment. Back to the benchmarks. 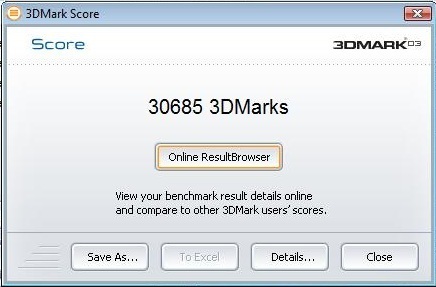 The 3DMark03 finally produced the expected high result of 30685 points after the bios update. In the 3DMark05 it was still a respectable 15328 points. 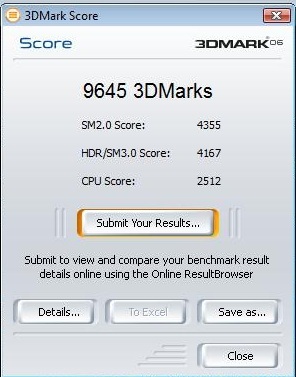 The 3DMark06 presented 9537 points afterwards, whereas 2408 points were for the CPU. Finally, in the 3DMark Vantage the results were 3918 points for the graphic, 21384 points for the CPU (due to the PhysX support) and a total of 4929 points. In order to make a comparison with the competitor graphic card ATI Mobility Radeon HD 4850, we selected the MSI GT725, which is a very similar competitor system apart from other components. 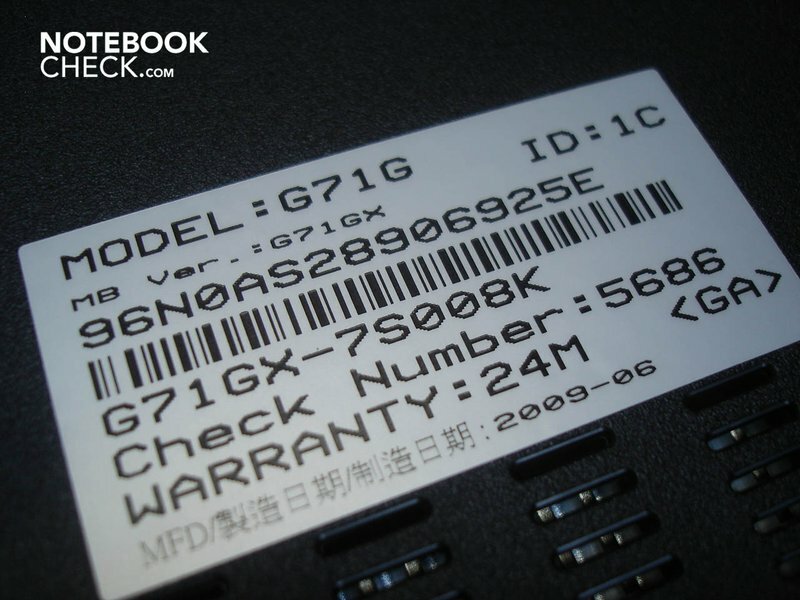 The MSI GT725 has a Core 2 Duo P9500 with 2.53 GHz, which is only clocked 100 MHz lower than the T9550 with its 2.66 GHz in the Asus G71GX. 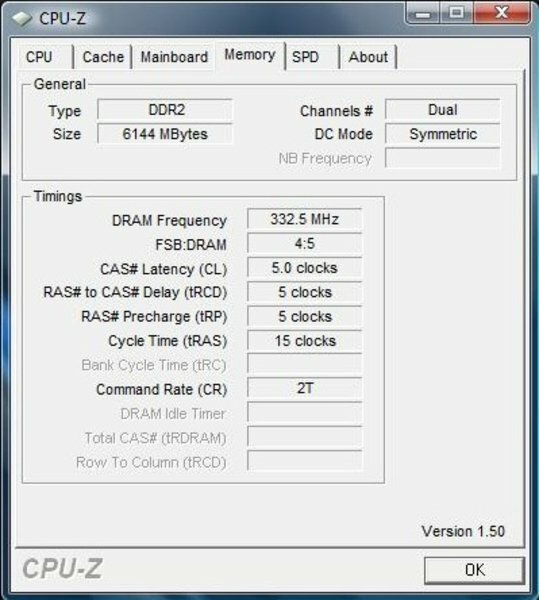 Additionally, both processors have a 1066 MHz FSB and a 6 MByte L2 cache. Furthermore, the MSI GT725, like the Asus, can be overclocked and is with its 2.93 GHz "only" 150 MHz faster than the G71GX, which reaches 2.78 GHz overclocked. 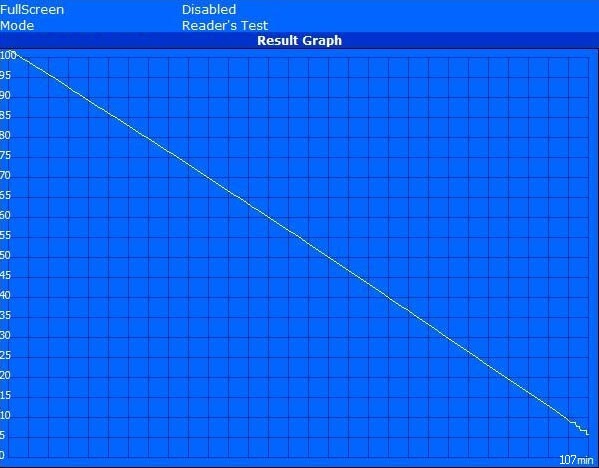 Thus, it's granted that the graphic card mainly turns the scale in the benchmarks. 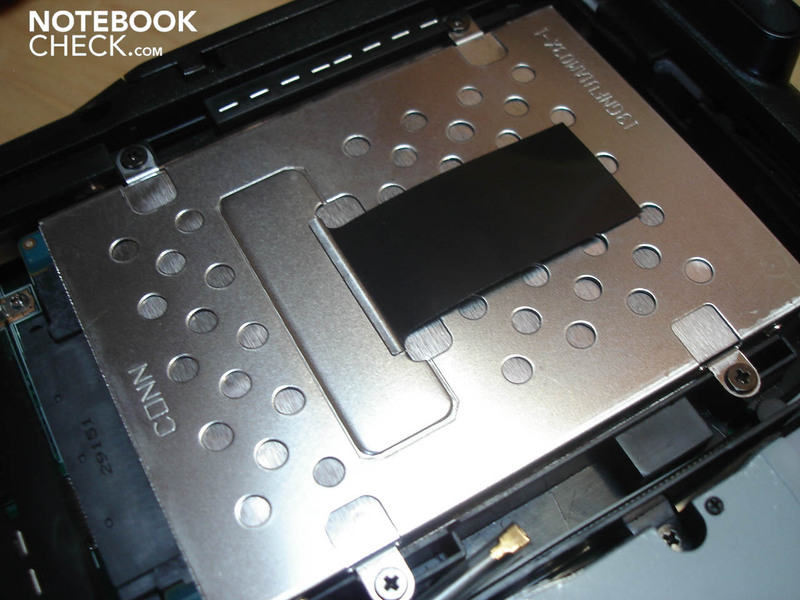 As the MSI GT725 has been overclocked in the test, we of course overclocked the G71GX. The G71GX achieved 16029 points in the 3DMark05 and is by about 500 points under the MSI GT725 with its 16496 points. The difference turns out to be considerably lower by about 150 points with 9645 (G71GX) against 9784 (GT725) in the 3DMark06. In the 3DMark Vantage, it's once again a difference of about 500 points. The G71GX reaches 4986 points, the GT725, in return 5500 points. The difference turns out considerably lower in the application benchmarks. 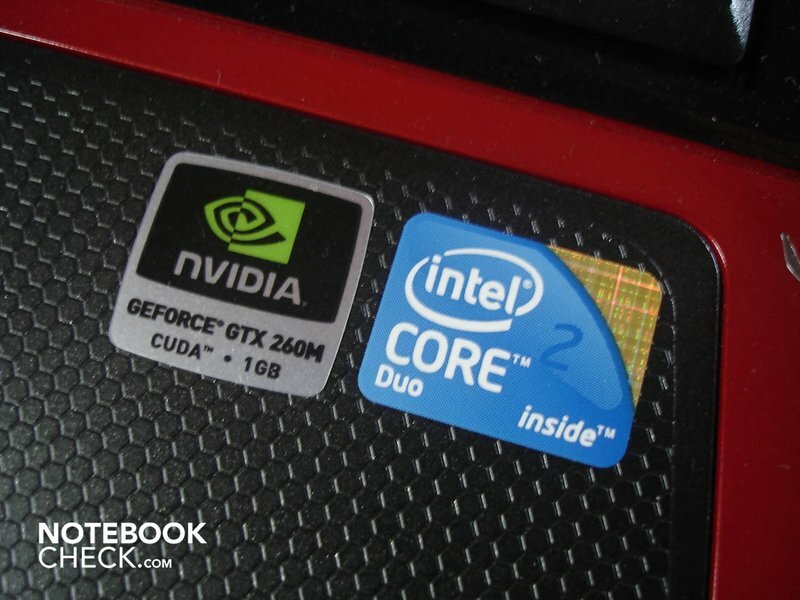 The Asus G71GX and the MSI GT725 differ by only 80 points in the PCMark Vantage. 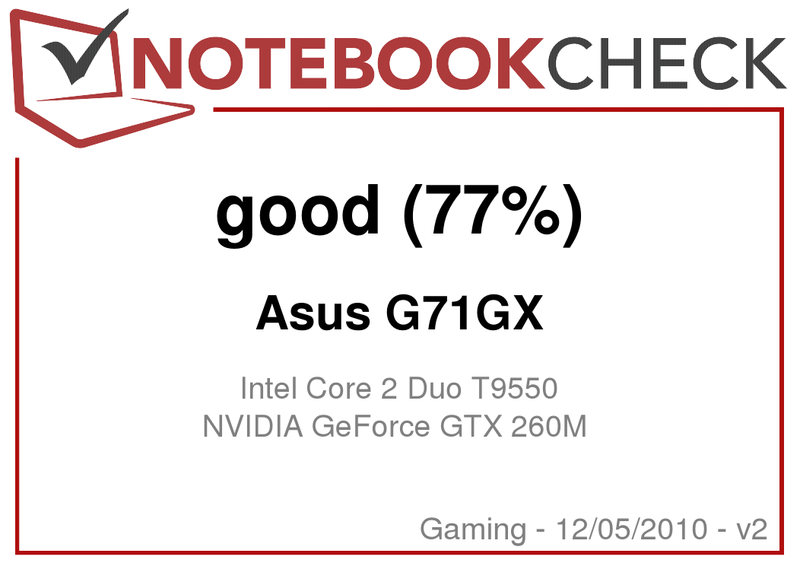 The overall score for the Asus G71GX is 4591 points and for the MSI GT725 4670 points, in comparison. 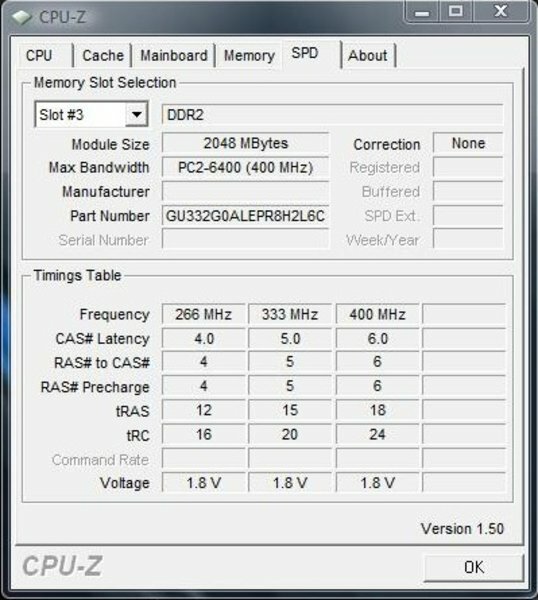 The result of the G71GX in an unoverclocked state is only marginally under that of the overclocked rate with 4522 points. The G71GX achieved 3246 points at single core rendering in the Cinebench R10, 6271 points at multi core rendering and 4084 points in the OpenGL benchmark. It was then 3346 points at single core rendering, 6445 points at multi core rendering and 4249 points in the OpenGL benchmark overclocked. It might not be significant, but we don't want to withhold the results of the Vista performance index from our readers. 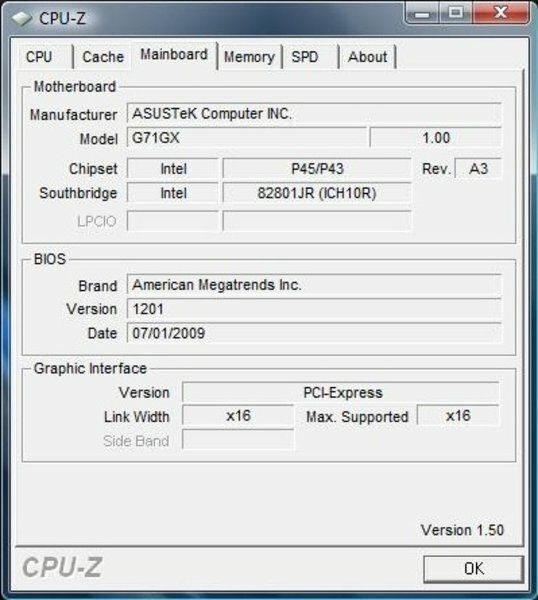 The processor was given 5.5 points, the graphic card 5.9 points "graphic" and 5.8 points for "games graphic". RAM and hard disk were denoted with the highest score of 5.9 points each. Principally, a very balanced result without a recognizable bottleneck. Asus has built-in an opulent 6 GByte DDR2-800 RAM for the system memory. 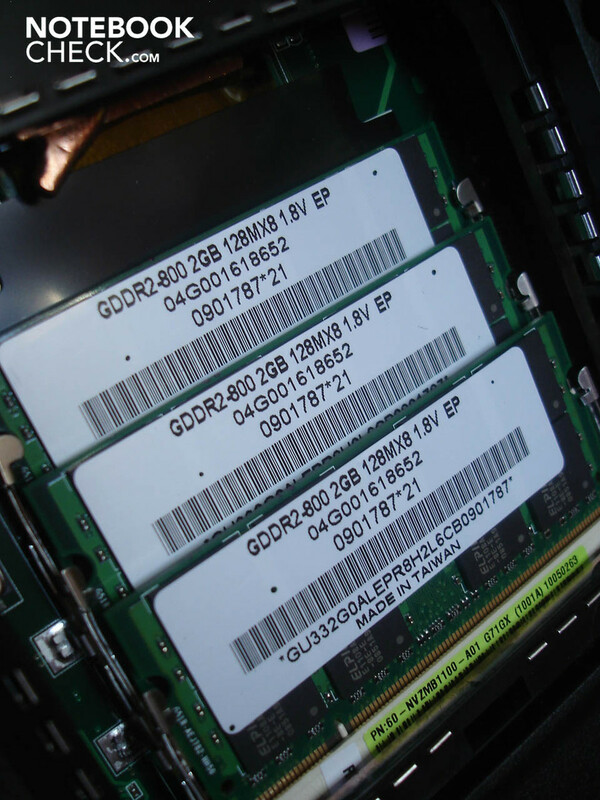 These are made up of three 2 GByte modules. 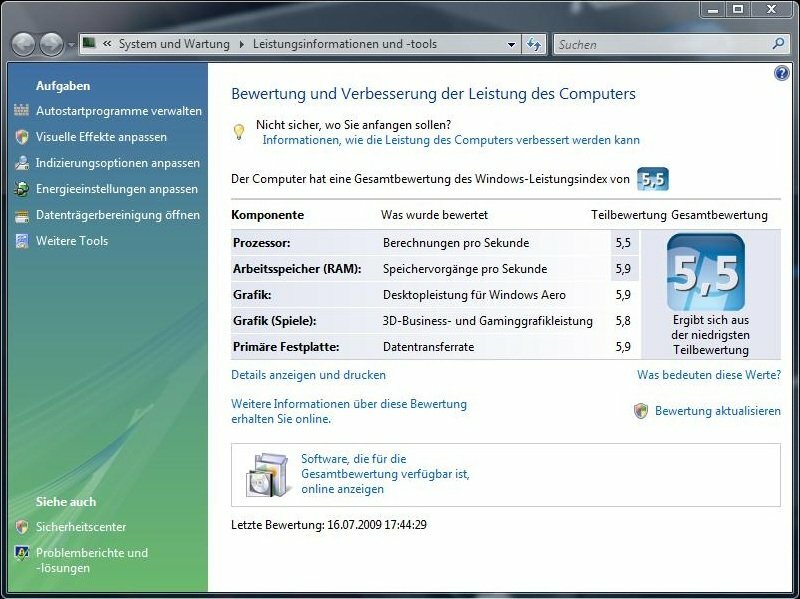 Because the 64 bit variation of Windows Vista Home Premium has been applied as the operating system, the entire 6144 MBytes can also be used. The given hard disk capacity with a total of 640 GBytes doesn't have to hide, either. Whereas Asus hasn't only implemented one, but rather two hard disks with 320 GBytes each and a fast 7200 rpm into the G71GX. In order to establish these rates, we fell back on the tool HDTune. The minimum transfer rate of the operating system's hard disk was 42.3 MB/s, the maximum was 90.6 MB/s and the average was a good 68.2 MB/s. The access rate lied at 15.9 ms, the throughput rate by a good 81.7 MB/s and the CPU load at 2.2%. 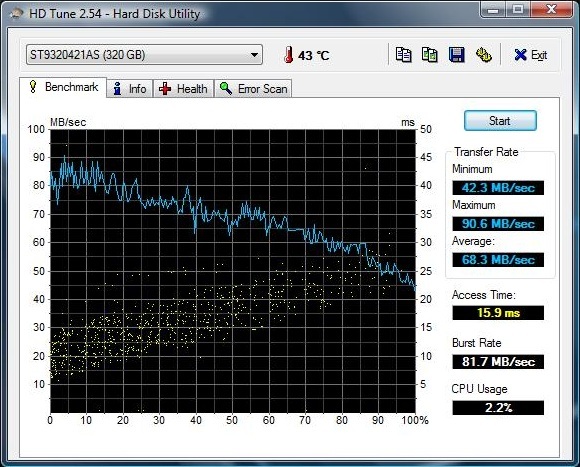 The second hard disk presented very similar values, except for the throughput rate. The minimum transfer rate was 40.0 MB/s, the maximum was 84.3 MB/s and the average was 67.6 MB/s. The access time was 15.8 ms, the throughput rate a good 143.1 and the CPU load was conclusively 2.9%. 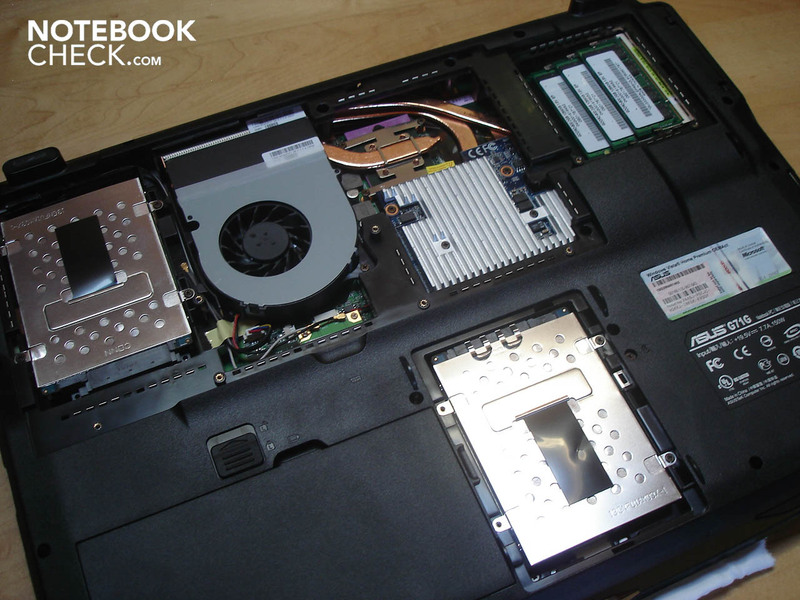 Both hard disks are divided into two equal partitions. Hence, there are four partitions available. How much sense this makes remains to be seen. But now enough of synthetic benchmarks. What really counts in practice is the raw gaming performance. We have selected tracks of the most different genres with varying system requirements for the gaming benchmarks and ran these, when possible, also in DirectX 10. If not noted otherwise, the results are not in an overclocked state. Whereas, it has to be said right away that the rates at overclocking were barely any higher. Let's start with the heavyweight Crysis. Because those who pass in Crysis, with exceptions like GTA4, are more than sufficiently armed for other games. 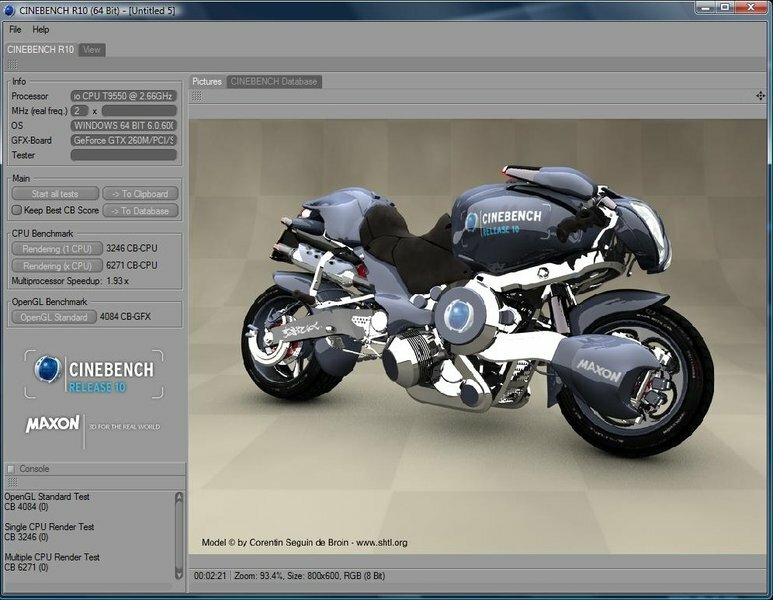 We let both the integrated CPU and GPU benchmark run in a resolution of 1024x768 for a better comparison. The G71GX achieved 109.5 fps in the CPU and 92 fps in the GPU runthrough at low details. It was 49 fps in the CPU, respectively 56 fps in the GPU runthrough at medium details. At high details the head start keeled over in favor of the graphic card - the CPU runthrough reached 36 fps, whereas the GPU runthrough reached 38 fps. We then activated the maximum five percent overclocking in high details. 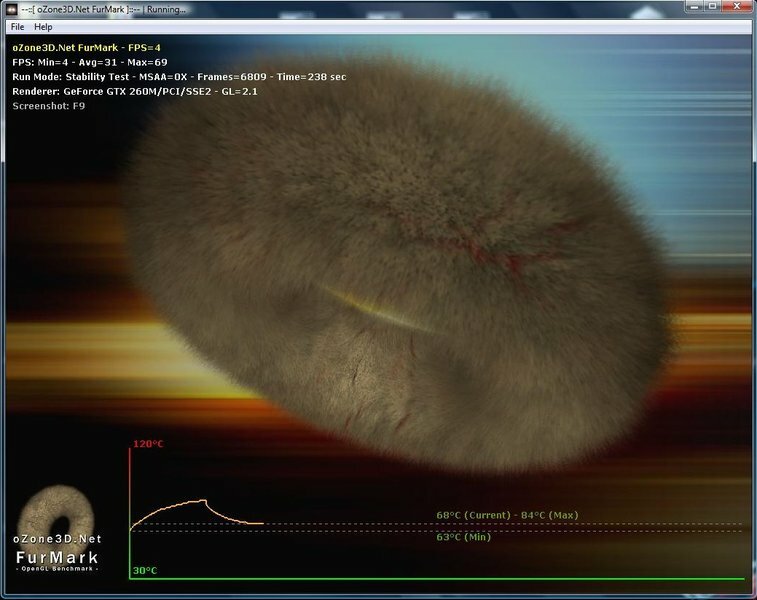 Now the rate was marginally higher in the CPU runthrough with 37 fps and in the GPU runthrough with 40 fps. Once again, the comparison of the Asus G71GX and the MSI GT725. As the MSI was still neck and neck (+5%) in the CPU runthrough with 38.9 fps at high details, it takes over the lead in the GPU runthrough by 4.7 fps (+12%) with 44.7 fps. Additionally to the benchmarks, we played Crysis "in game" at high details and DirectX10, too. It could be played fairly smooth at an average of 33 fps (minimum 11, maximum 79). 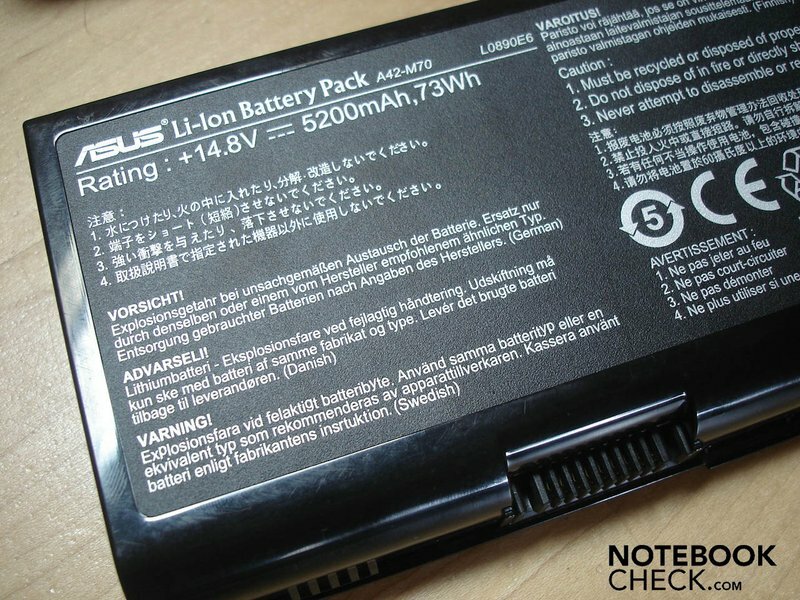 We also tested the performance in battery mode with Crysis while we were at it. The velocity crashed from 37 to 17 fps (-54%) at maximum details in the CPU benchmark and in the GPU from 40 to 19 fps (-52.5%). 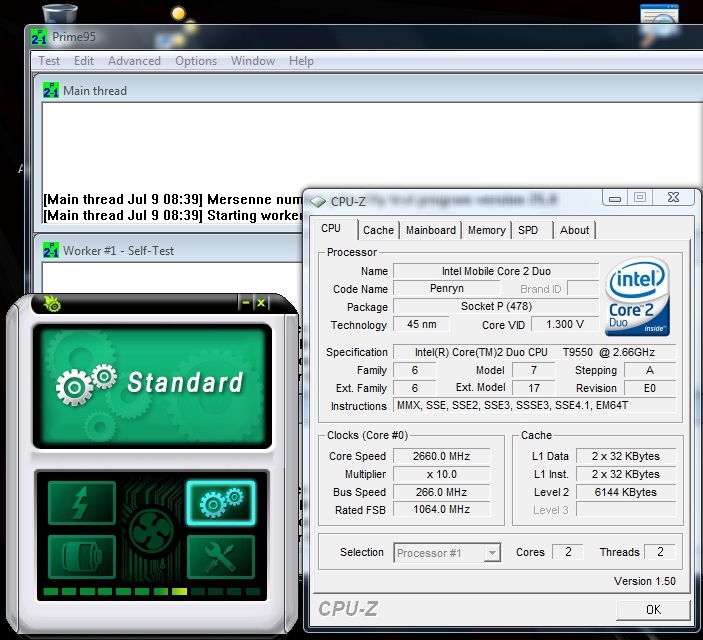 We also used the integrated benchmarks for WiC. These ran respectively in the resolution of 1024x768. World in Conflict showed an average of 47 fps (minimum 10, maximum 115) at medium details. In high details it was a total of 38 fps (minimum 8, maximum 112). The benchmark ran at an average of 30 fps (minimum 8, maximum 83) just still smooth at high details and DirectX 10. The MSI GT725 lagged behind for once by 7% with 28 fps. But the ratio changed in an overclocked state. With 46 fps the MSI was ahead of the G71GX with 33 fps by 39%. It becomes obvious here, how well World of Conflict reacts to a high processor rate. 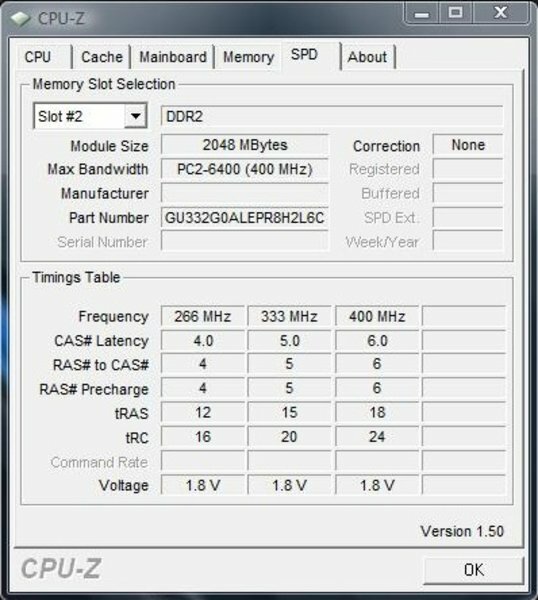 As the Asus gives 2780 MHz in an overclocked state, the MSI runs faster by 150 MHz with its 2930 MHz. 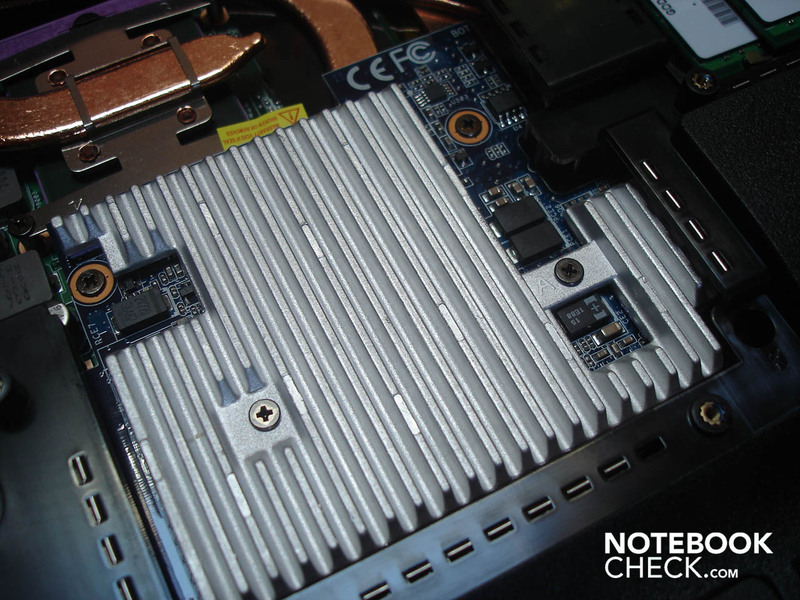 In Fear 2, the Asus G7GX and the MSI GT725 lie very far apart from one another with 30% in an overclocked condition. 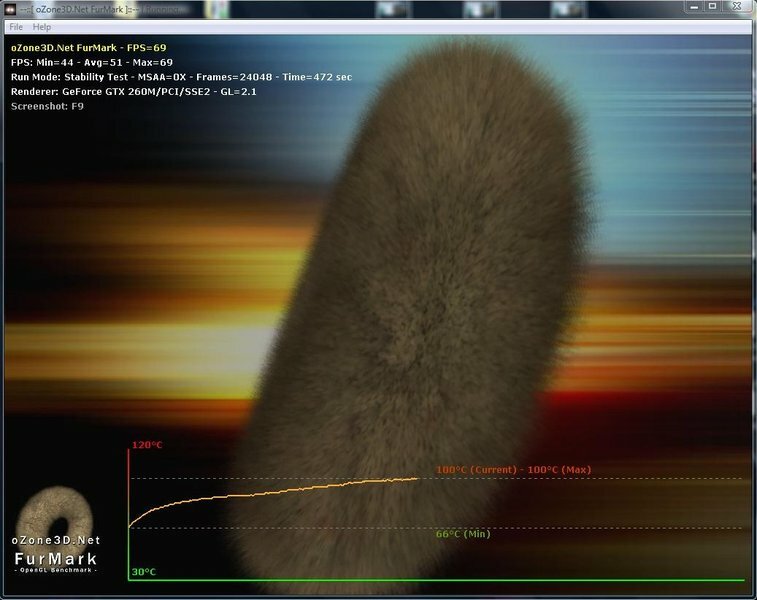 The G71GX reached a very well playable 66 fps (minimum 33, maximum 90) at a resolution of 1280x1024, high details and 2xAA. But the MSI GT725 exceeded this quite a bit with 86 fps. It was an average of 65 fps (minimum 32, maximum 88) in high details unoverclocked with the G71GX. 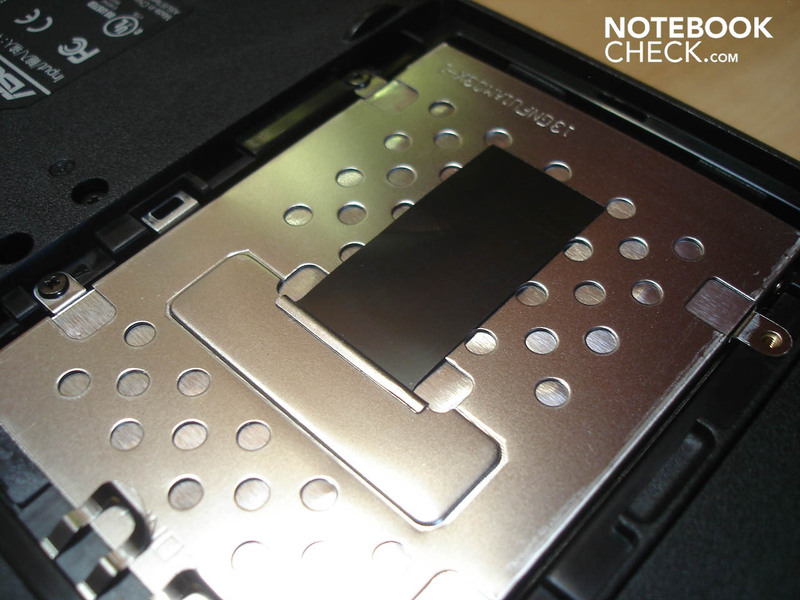 The notebook achieved 89 fps (minimum 52, maximum 133) at a resolution of 1024x768, medium details and 2xAA. Finally, the Asus made a swift as an arrow 132 fps (minimum 67, maximum 224) at a resolution of 800x600 and low details. In Race Driver Grid, the difference between the two overclocked notebooks was 15% in favor of the MSI. This reached 62 fps at a resolution of 1280x1024, high details and 2xXMSAA, whereas the G71GX reached 54 fps (minimum 43, maximum 90). The G71GX reached, unoverclocked, an average of 53 fps (minimum 39, maximum 63) at high details. It was an average of 72 fps (minimum 57, maximum 99) at 1024x768 and medium details, at 800x600 and low details even 104.5 fps (minimum 77, maximum 143). Anno 1404 reached a very good average of 132.5 fps (minimum 82, maximum 235) at a resolution of 1024x768 and low details. In a resolution of 1280x1024, high details and 4xAF it was still a good and smoothly playable 39 fps (minimum 0, maximum 60). Left 4 Dead ends our benchmark marathon. This ran at 640x480 and low details with a very high average of 107 fps (minimum 59, maximum 231). Finally, it was an average of 69 fps (minimum 34, maximum 118) at 1024x768 and high details. First: the G71GX is able to present almost all games in high to maximum details smoothly. If you close your eyes and sit in front of the G71GX, you rather have the feeling you have got a jet ready for takeoff before you. 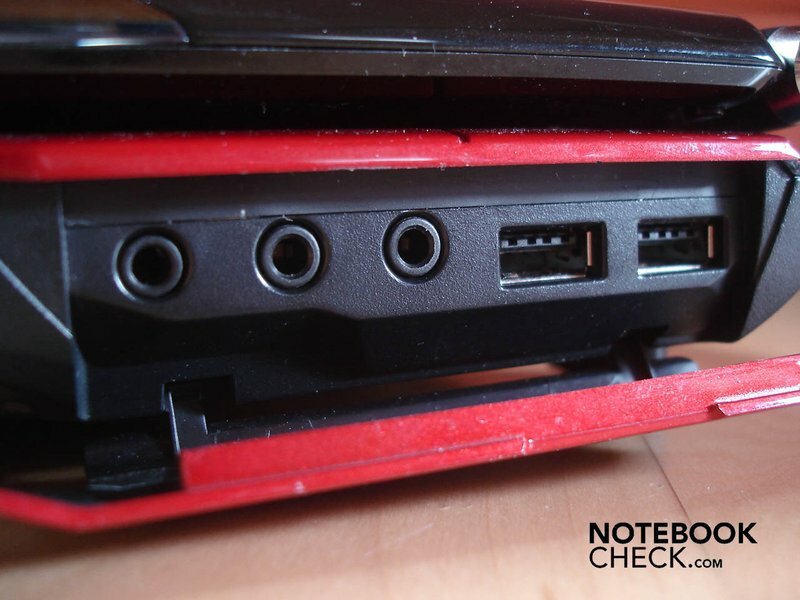 The notebook is even very audible with 35.6-38.5 dB(A) in idle mode and therefore very existent. The noise increases to an unbelievable 37.4-48.2 dB(A) under load and is almost unbearably loud. Additionally, the drive doesn't work very quietly at data access with 41.1 dB(A) and rattles like a jackhammer. Therefore, you shouldn't be very noise sensitive to put up with the G71GX for a longer period of time. But if you sit far enough away from the display (for movies for example) or operate media like music at a certain volume, the system noise then loses its intensity and it gets bearable. 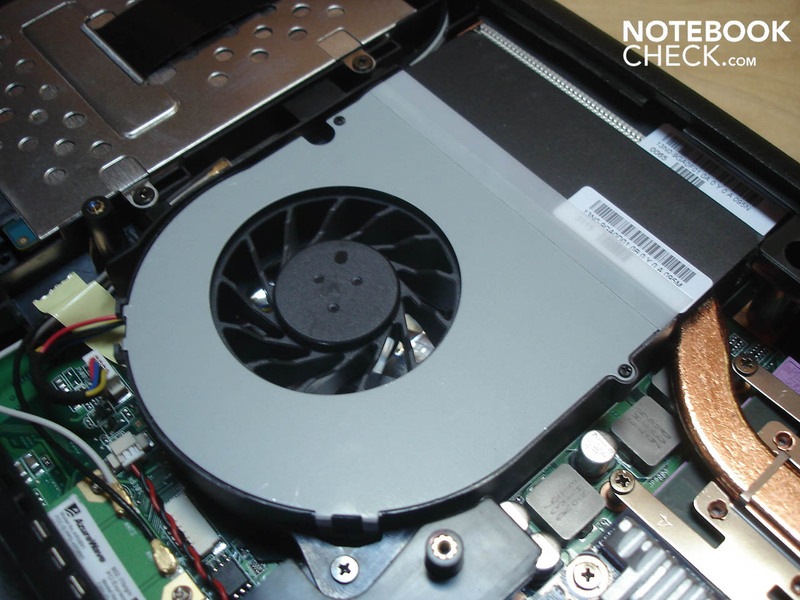 A positive side effect of the loudly running fan is the half way low temperature development, for a gaming notebook. 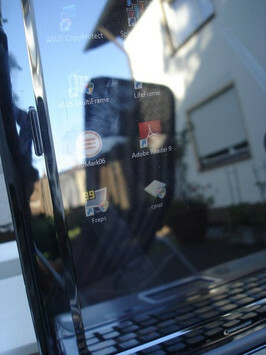 The G71GX's upper side warms up to a maximum of 36.1 degrees Celsius (upper center) and the bottom side to a maximum of 41.2 degrees Celsius (upper center). Therefore, even longer gaming sessions are no problem. 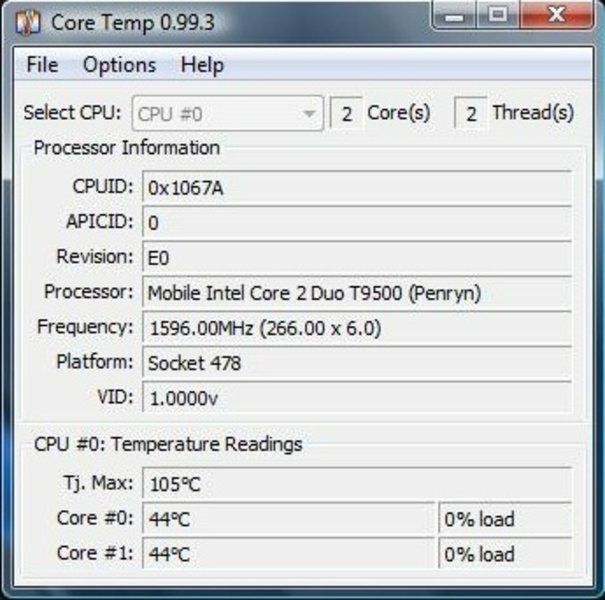 The CPU can also convince with the temperature. This warms up to a maximum of 65 Degrees Celsius, even under full load (Prime95), overclocking inclusive. The CPU stays pleasantly cool at around 40 degrees in idle mode. 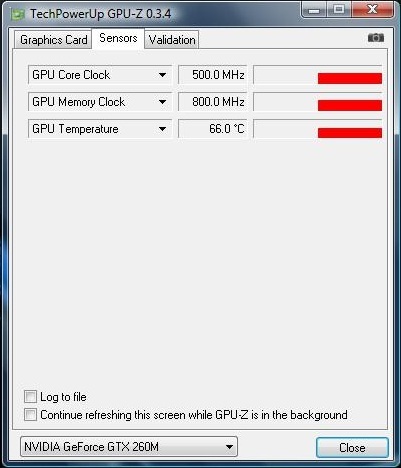 In return, the graphic card gets up to 60 degrees warm in idle mode. 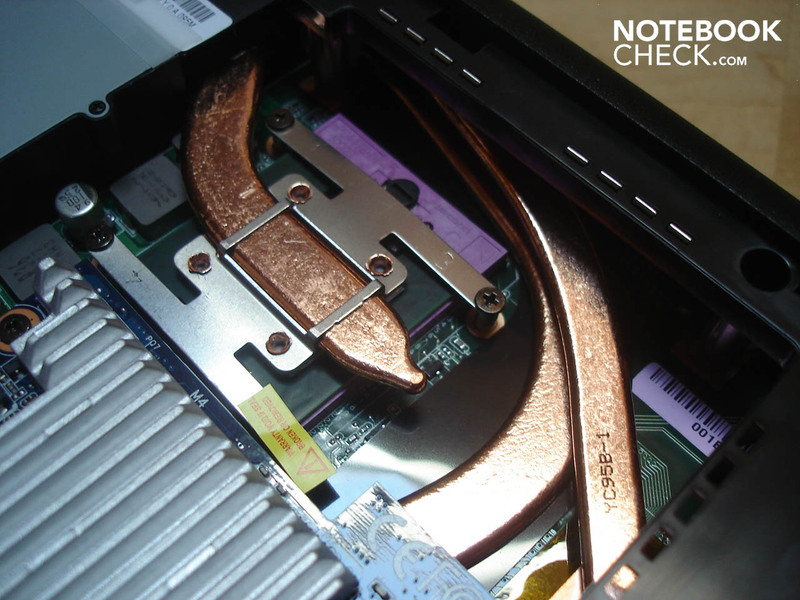 The Geforce GTX 260M reaches an extremely high temperature with a maximum of 100 degrees under full load (Furmark), which is otherwise only known from ATI chips. The mentioned performance-crashes still turned up sporadically after the bios update to version 1201: Thus, a temperature of 84 degrees was too much for the graphic card in Furmark at one runthrough and the performance suddenly crashed blatantly. This was expressed in a nosedive from an average of 45 to 4 fps. The moment where the graphic card quits is very recognizable in the right screenshot, as the temperature suddenly started to sink again. The hard disks also get quite warm with around 50 degrees Celsius. Talking about temperature: The included adapter isn't only unbelievably big, but also gets almost alarmingly hot. (+) The average temperature for the upper side under maximal load is 29.2 °C / 85 F, compared to the average of 32.9 °C / 91 F for the devices in the class Gaming. (+) The maximum temperature on the upper side is 36.1 °C / 97 F, compared to the average of 39.3 °C / 103 F, ranging from 21.6 to 68.8 °C for the class Gaming. The G71GX has a total of four loudspeakers with Dolby Surround Sound support. 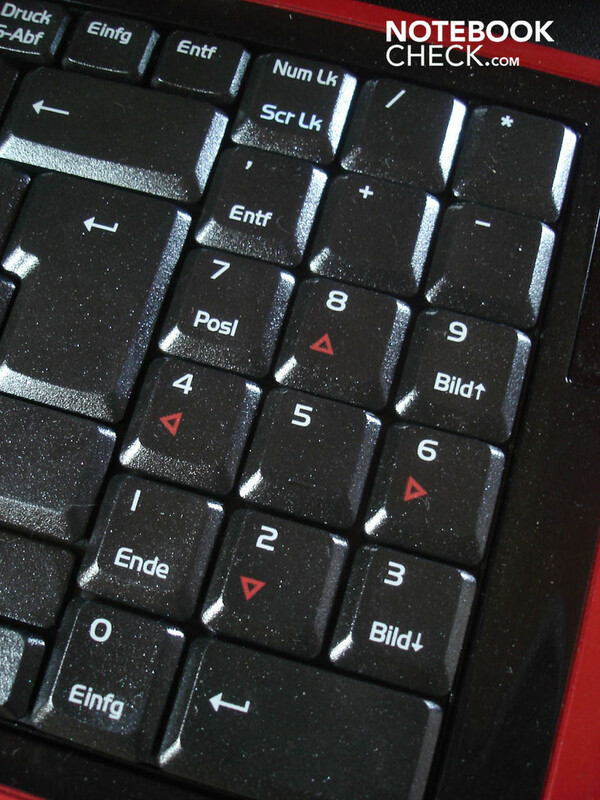 Two of them are, as common, placed left and right above the keyboard. The other two are found discreetly placed on the case's front side. 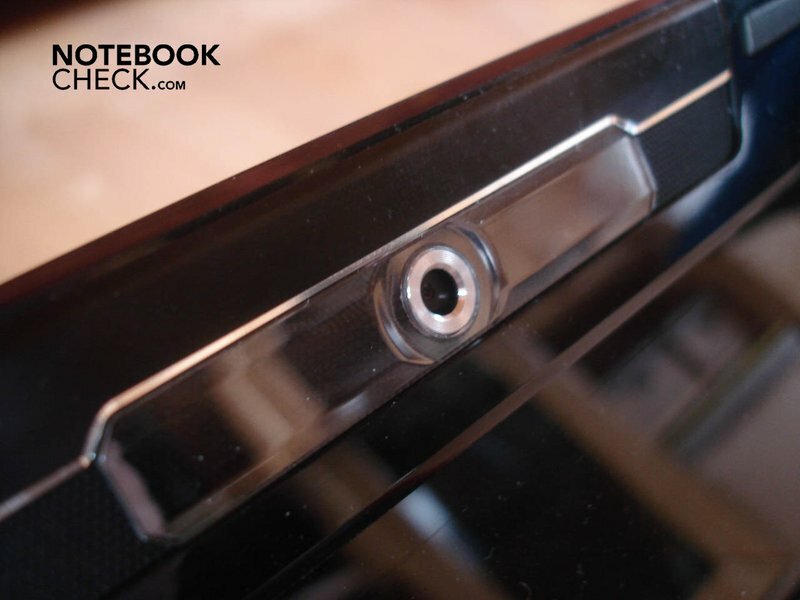 The sound is to be seen as above average for a notebook and has a full sound at a good maximum volume. But the sound seems somewhat lax and tinny anyway. 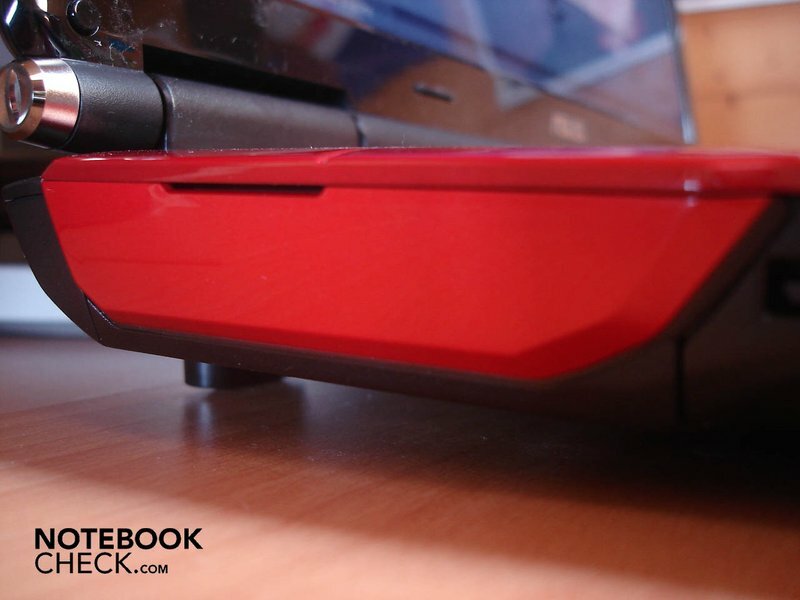 When the G71GX is attached to an according external system, the sound is then very convincing. Especially effects like explosions were fun in our test with a Blu-Ray movie. 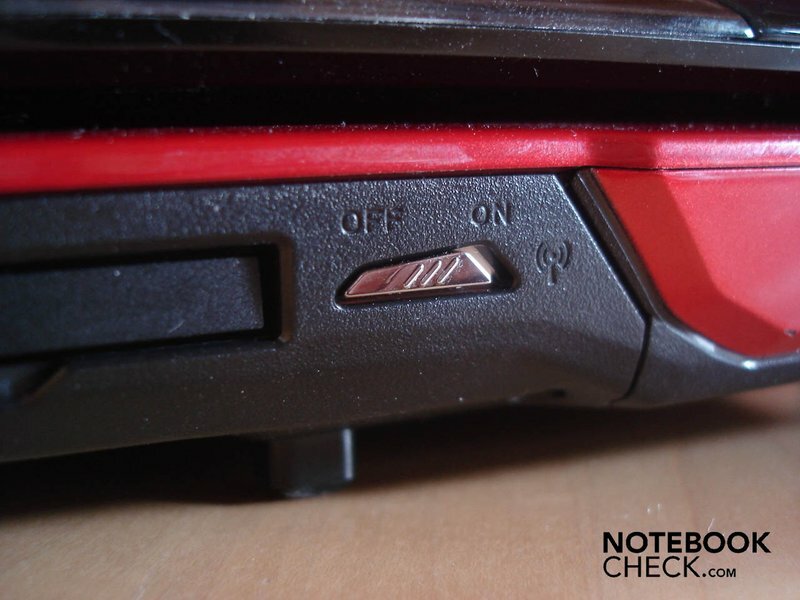 A short battery life is something known in gaming notebooks and therefore the G71GX doesn't surprise much here, either. All results were established with deactivated overclocking and without case lighting. The battery runtime under load and at maximum brightness was 1 hour and 15 minutes (Classic test from BatteryEater). 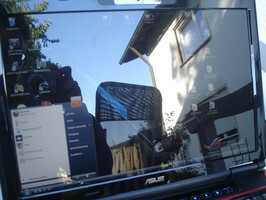 The G71GX only ran 1 hour and 25 minutes at internet surfing via WLAN and maximum brightness. 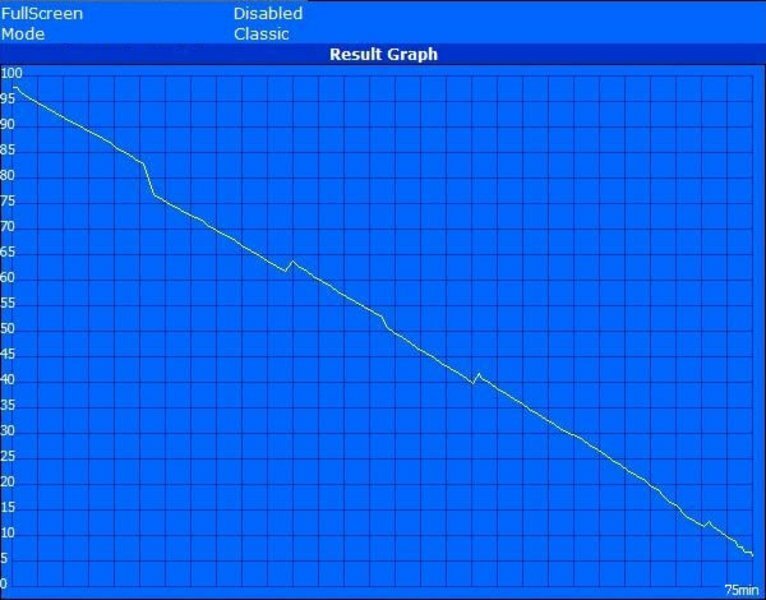 The maximum runtime stayed under two hours with 1 hour and 47 minutes, which is even too little for a gaming notebook (minimum brightness, Reader's test from BatteryEater). The biggest disappointment then followed at movie rendering. The movie enjoyment with our Blu-Ray already came to an end after just 1 hour and 6 minutes. A normal DVD turned out to be a bit better, as the G71GX survived for 1 hour and 10 minutes at rendering. An 8 cell Lithium-Ion model with 73 Wh is employed as a battery. The battery has a somewhat unusual position. 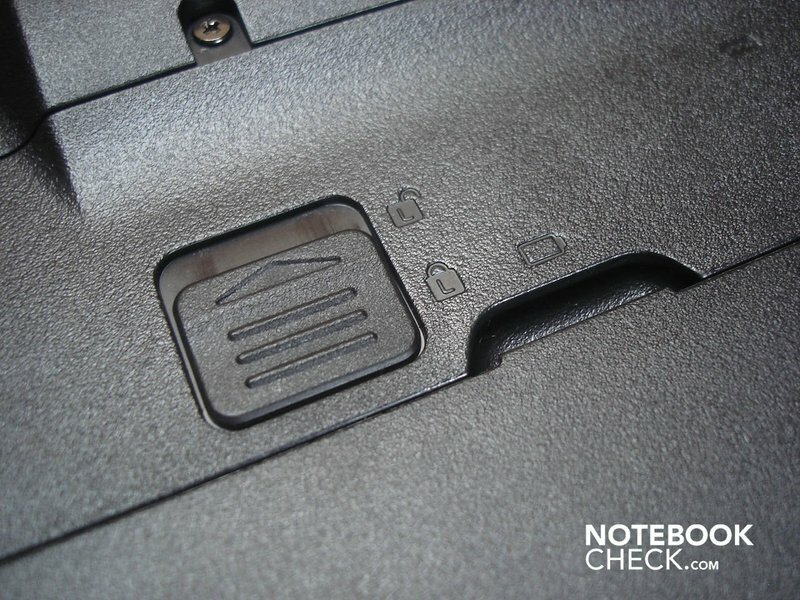 It's not pushed into the back of the notebook, as usual, but as in many DTR devices common, pushed into the bottom side and is so to say, "integrated into the notebook" since there is even a case foot on the battery. 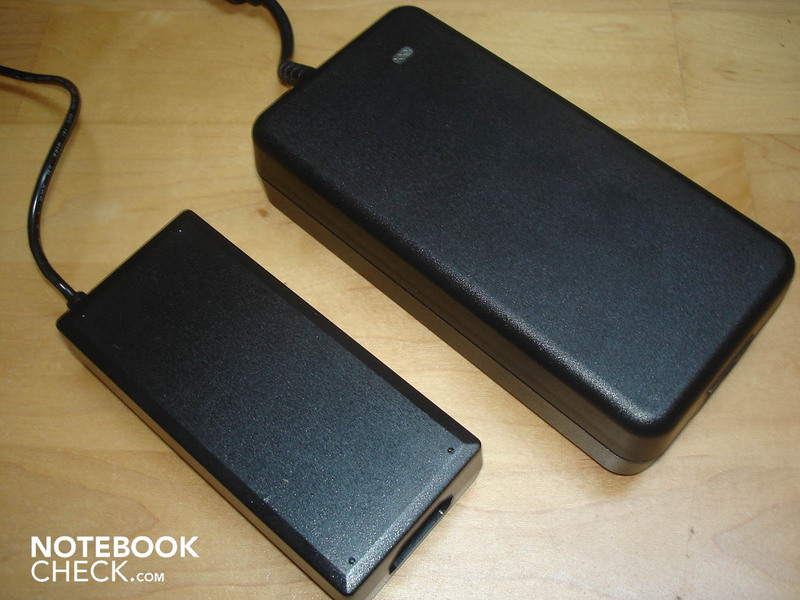 The high power consumption values of 0.7 Watt in a deactivated, and 2.4 Watt in a stand-by state are eminent. This is due to the permanently turned on Express Gate light, among other things. Otherwise the power consumption is between 48.4 and 56.6 Watt in idle mode, and between 104.5 and 127.6 Watt under load. The Asus G71Gx looks very good at first sight: The design is appealing, a vast number of connections and supplies are included, the keyboard and the touchpad are convincing and the components speak for a high performance. You are, however, first confronted with the experience of a slow, due to the many preinstalled programs and due to the problematic bios, erroneous system. As soon as the bios has been updated (version 1201) and the installation cleaned, you get what Asus promised: a swift as an arrow gaming notebook. But that was it by and large with the plus points because the G71GX has to pocket much critique. The battery life is disappointing, the display mediocre and the soundscape much too loud. Therefore, at the moment we can only recommend the G71GX to experienced gamers, where absolutely nothing goes over performance and who can live with these kinds of disadvantages. 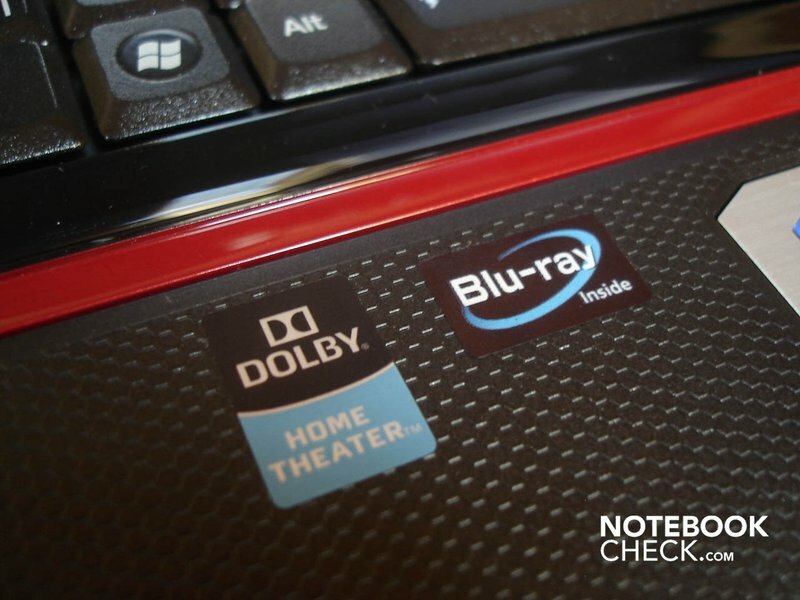 The G71GX isn't recommendable for multimedia fans, despite Blu-Ray drive. The very good task and gaming performance. A slightly better workmanship and materials of a higher quality. Also a better balance between system noise and cooling. How much of an uncompleted impression the G71GX made with the erroneous bios in the state of delivery. 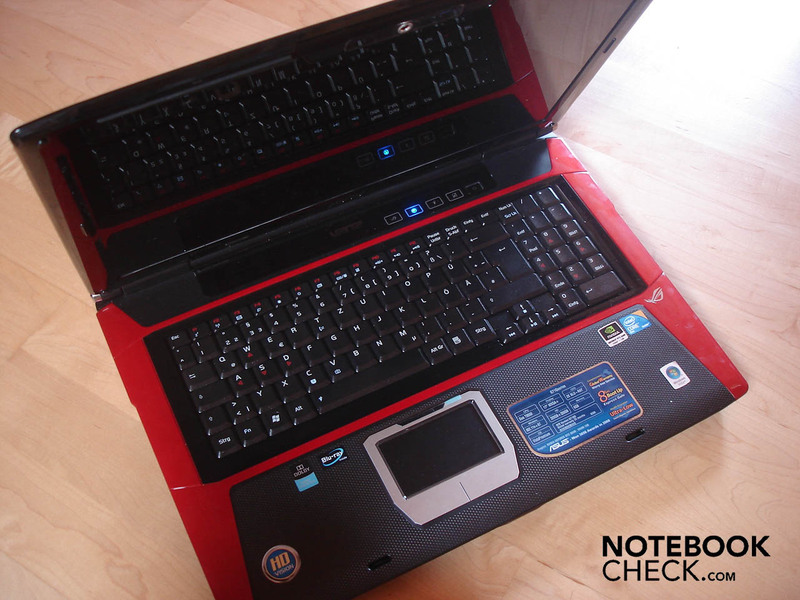 Other efficient and 17 inched gaming notebooks in the field of 1300 Euros, like the GT725 from MSI.